Tagged under Lerche, TYPE-MOON, Crossovers, Series. Whilst being a comedy and all , it is heavily recommended that the audience have a base knowledge of both Fate/Stay Night and Tsukihime to fully enjoy the comedy potential of this series. Not that story elements play a progressive role in the plot - which is almost non-existent to begin with but the fact that some jokes requires the audience's knowledge from their respective series to even understand such jokes in question. Consider this Anime a "dream come true" for any Type-Moon fan. Pretty funny parody series of the various Type-Moon works, mostly for Fate/stay night and Tsukihime. It's one of those guilty pleasures you can have fun with and see the characters engaged in comedic situations. I felt bad for poor Lancer all the times he's been offed and being manhandled by Berserker in one episode. That Grail-kun reminded me too much of Madoka's Kyubey, it's scary. I wished they used the Fate/Zero & Kara no Kyoukai characters more rather than just the minor cameos at the end. Seeing how a crossover parody like this could work, it would be nice to see something like this done for Key's works of Kanon, Air, Clannad, and Little Busters!, it would be fun to see crossover parodies done for these series. 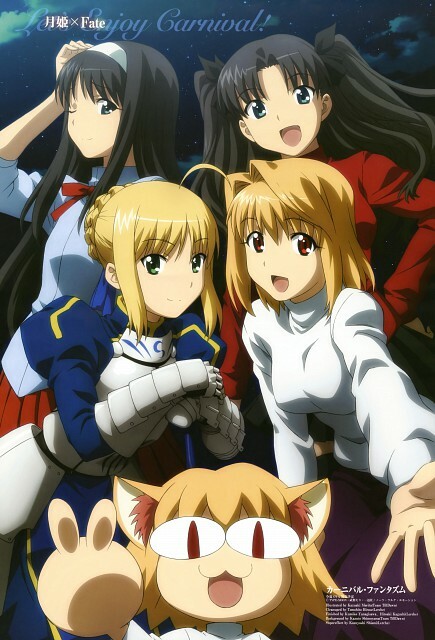 It's a perfect anime when you're a fan of TYPE-MOON, and if you want laught a lot. Most of gags are totally hilarous, it's perfect for the moral !